According to Apple, Siri is the most-used digital assistant on the planet. But for anyone who has ever used Alexa or the Google Assistant, that doesn’t mean Siri is always the smartest. To give Siri more ways to help you out, Apple has created a new app called Shortcuts that will debut with iOS 12. The idea behind Shortcuts is that by giving the apps and software you already use a new way to communicate with Siri, Apple’s digital assistant will be able to more easily make suggestions and create reminders that are tailored just for you. At WWDC 2018, Apple software VP Craig Federighi demoed this by creating a shortcut in Siri so that if someone asks “Hey Siri, I lost my keys,” Siri can talk to the Tile app and sound the dongle on your key chain to make them easier to find. What’s more, if you don’t like a particular phrase or keyword, you can customize it to something you’re more likely to remember. Shortcuts aren’t just relegated to apps, either. For example, if you want to check the stats of the Cavs and Warriors game, you could say “Hey Siri, it’s game time,” and let Apple’s assistant pull up the latest scores. Apple says the Shortcut Apps was designed to make Siri more proactive, so that it can offer up useful suggestions without even needing you to ask. So if you’re the kind of person who orders coffee every morning, Siri will now have the ability to remember your favorite drink order, and automatically ask if you want to order it during your morning commute so it’s ready to grab as soon as you walk into the shop. Siri will even offer up smaller, but still helpful tidbits, such as a reminder to turn on silent mode when you’re at the movies, or to call your grandmother on her birthday. Here’s a sample list of different shortcuts looks like on iPhone. 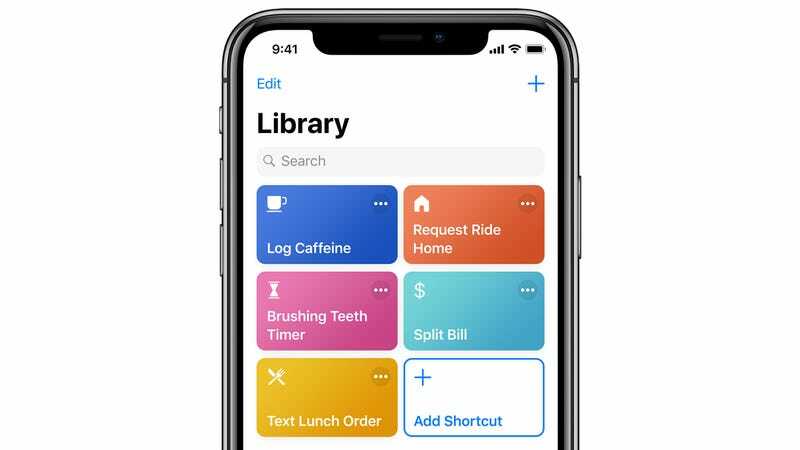 To help you set Siri up with as much info as possible, the Shortcuts app will include a simple editor in iOS 12 so you can create your own routines, while also featuring a list of pre-made shortcuts that might be relevant to you. While I’m not sure Shortcuts is going to be the thing that will make Siri on the HomePod as good as Alexa or the Google Assistant, being able to fine tune how the AI in your phone works with you is certainly a welcome improvement.